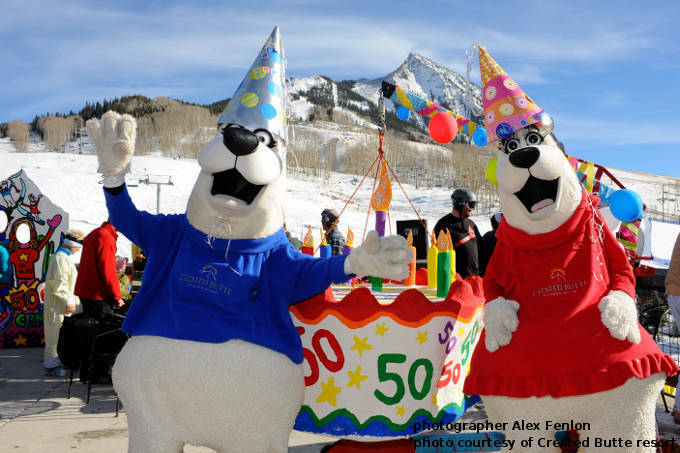 Mascots help to give a ski resort an image and brand recognition. Don't under estimate the power of a mascot! Last year Ad Age released an article hailing the resurgence of the mascot in the age of social media. 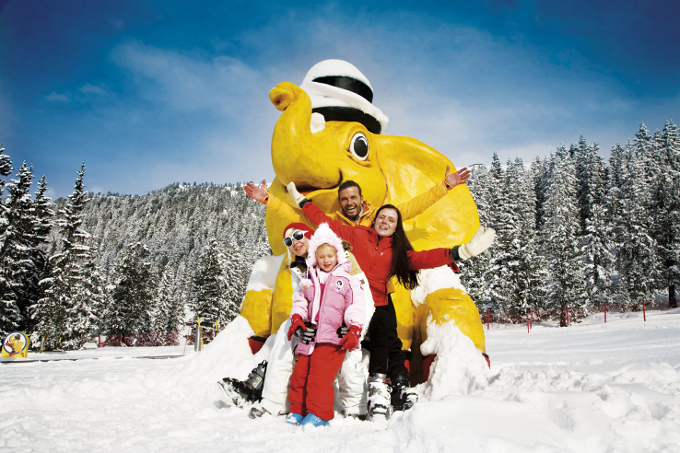 Originally contrived to bring luck, mascots are commonplace in ski resorts around the world. You might not spot them in our spherical panoramic views but you will find them peppered in iphones and family albums from Japan to Utah. You'll also see their likeness on signs, websites, and park material and you'll even catch a few tech savvy characters with their own Twitter and Facebook accounts. 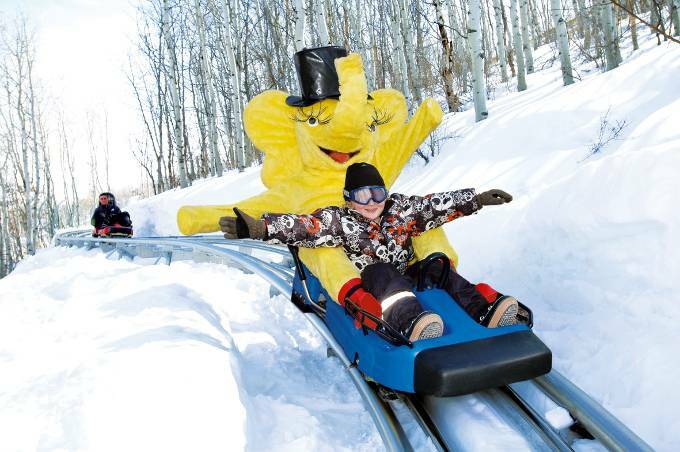 A hit with young children, many parents consider an entertaining mascot a MUST for any family ski vacation. 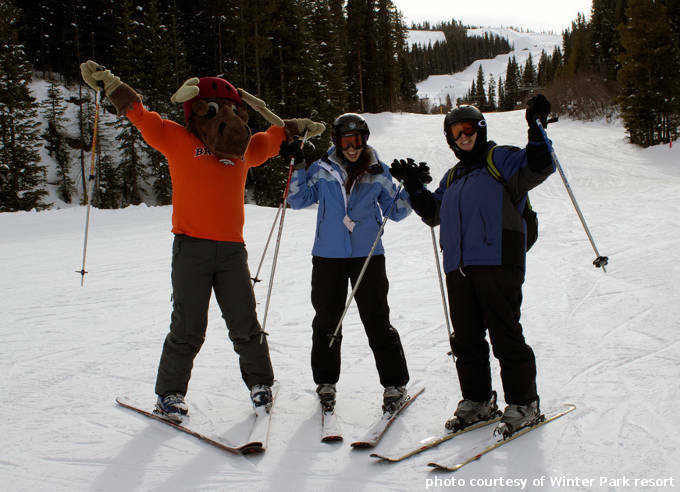 Ski resort mascots are brand ambassadors to the mass of visitors of all ages. Each unique character works to help to create a public identity worthy of their corporate values. Generally silent and gender neutral, these friendly beasts moonlight as marketers spreading goodwill throughout their respective parks. As silent spokesman, they still manage to speak volumes when it comes to resort protocol and brand representation. They can be counted on to jump through hoops (sometimes literally!) for the good of the brand. Great characters come in threes -- The Three Little Pigs, the Three Bears, The Three Stooges -- and Sugarloaf's mascot trio -- Amos the Moose, Blueberry the Bear, and Pierre the Lumberjack! Nothing like being greeted by a big polar bear on skis! Once Bubba set foot in Crested Butte there was no turning back. He quickly recruited his girlfriend, Betty, to join him on the slopes. Find them at Crested Butte. Also see our review of Crested Butte. The legendary Yeti of Old Speck Mountain began to reveal himself several winters ago in the woods of Sunday River Maine. Some believe he was drawn down by the 50th anniversary celebration of Sunday River. 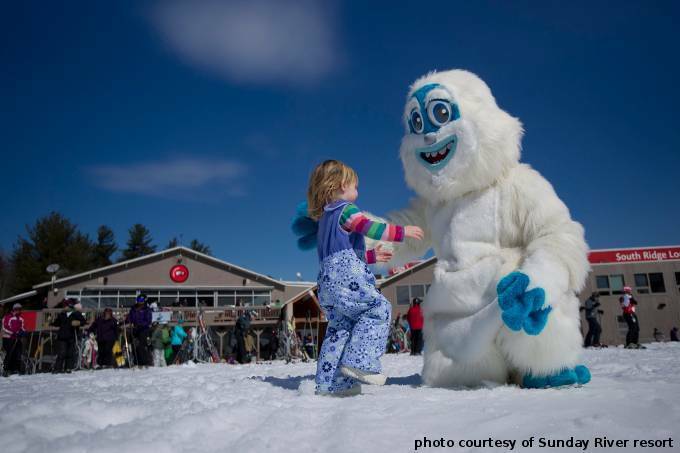 Regardless of what drew him near, it's evident that he has become friendly (as far as snow monsters go) with the skiers and riders of Sunday River. Just be sure not to confuse him with the Utah Yeti. The last think you want to do is tick off an abominable snowman! 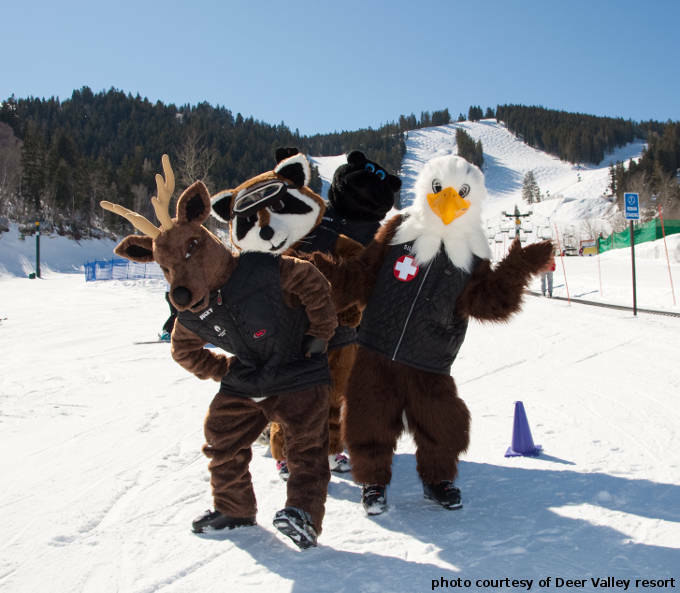 Bucky, Deer Valley's original mascot, had so many duties that he's recruited multiple friends to help manage different areas of the resort. You'll find Bucky the Deer greeting children and spreading cheer throughout the resort as he hosts special kids events. Quincy the Bear supports Bucky's mission by making sure that every child is having a good time while visiting the resort. Ruby the Raccoon preps guests for their stay at the resort by offering advice on how to best plan for their trip to Deer Valley. Silver the Eagle's number one concern is safety. She stresses the importance of safety to children at the resort by making sure they understand the rules for a safe and FUN experience. Find them at Deer Valley. Also see our review of Deer Valley ski resort. Meet Riperoo, the official hound of Vail Resorts! Imagined by an in-house artist in Breckenridge and named by a local elementary school student, this hound was so popular that he quickly became the official mascot of all Vail Resorts. Also see our reseort reviews of Breckenridge, Vail, Beaver Creek and Keystone. 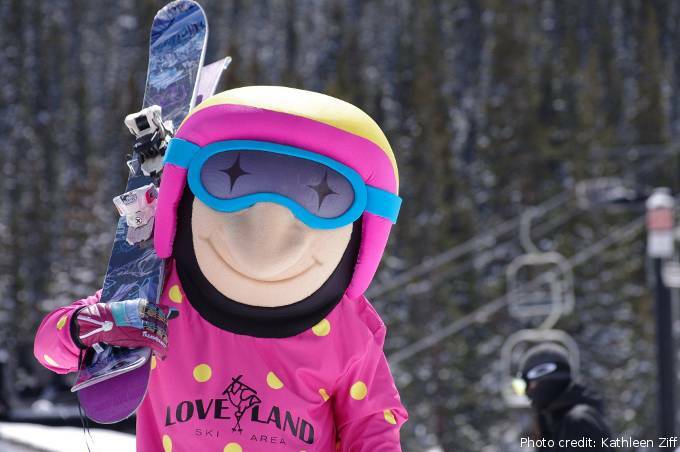 Not all mascotts are furry loveable creatures, Loveland's mascot is a dude. Find Loveland Guy at Loveland Ski Area. For more information, see our review of Loveland Ski Area. 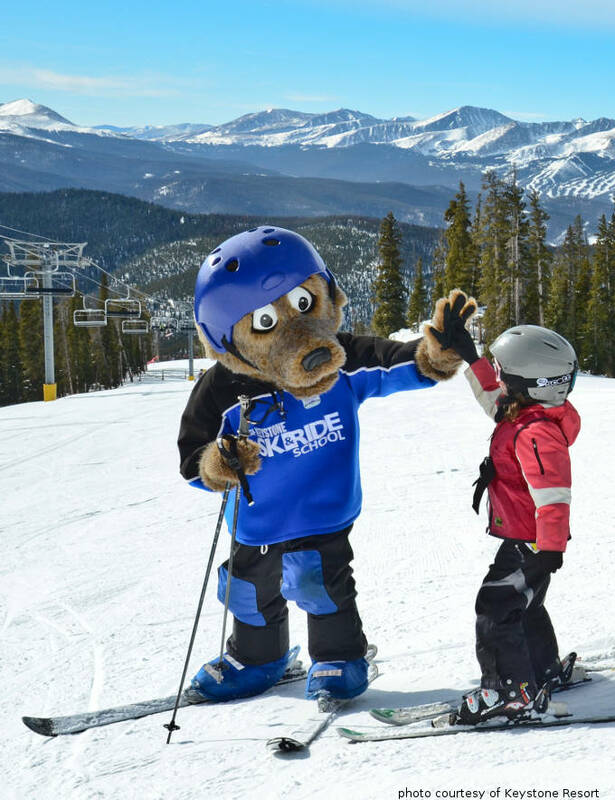 Loveland CO ski area mascot is "Loveland Guy"
Get free high-fives, photos, and hugs from your favorite skiing moose. This Winter Park staple is a hit with the kids. As a walking representation of the spirit of the mountain, you'll always find this playful mammoth animating and entertaining guests. He's got a strict job description -- forged at corporate headquarters it details his signature "jaunty walk" and "hops of excitement!" 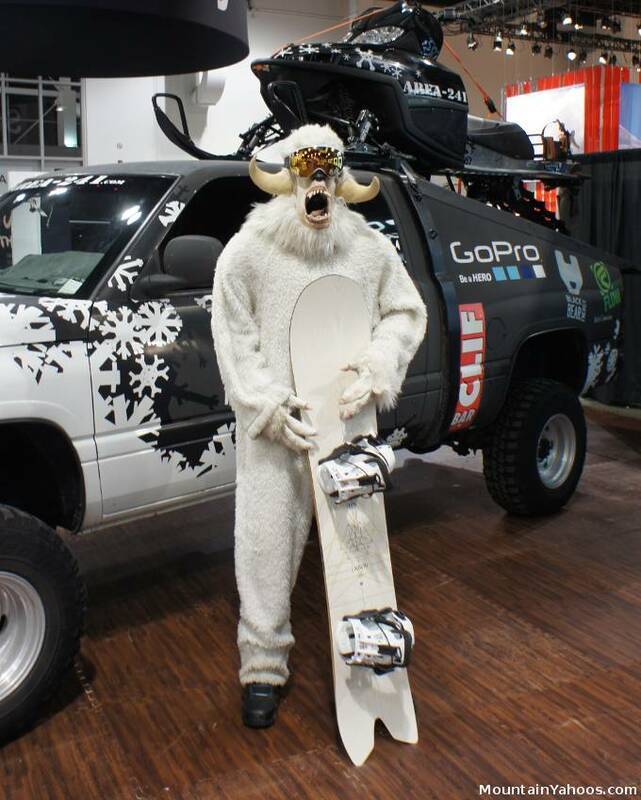 Find Woolly at Mammoth Mountain. Also see our review of Mammoth Mountain ski resort. 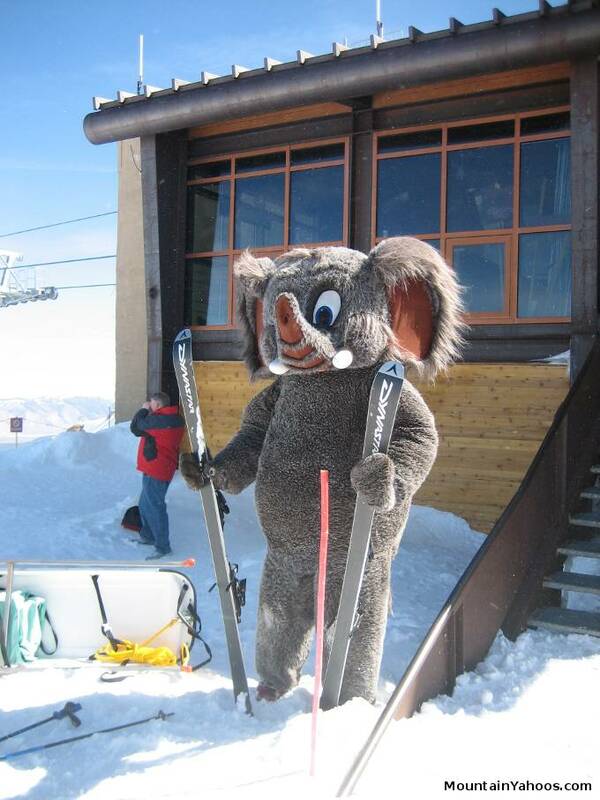 Talk about multi-talented - meet Murdock, the official mascot of Canyons Resort in Park City, Utah. 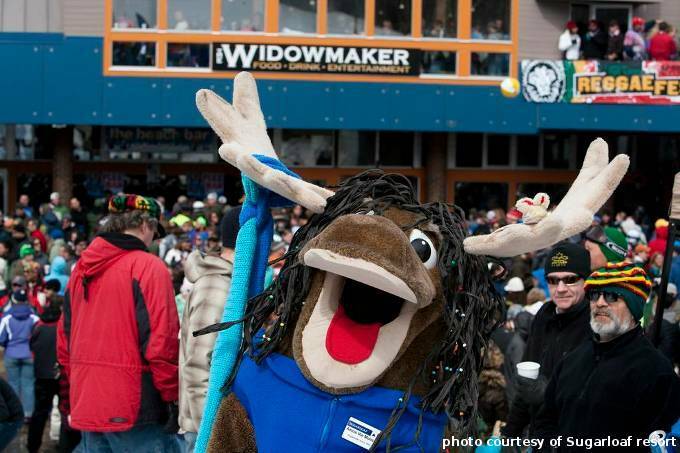 When this Moose isn't skiing the slopes, you'll find him jammin' with his band! Be sure to catch a show next time you're in Park City. 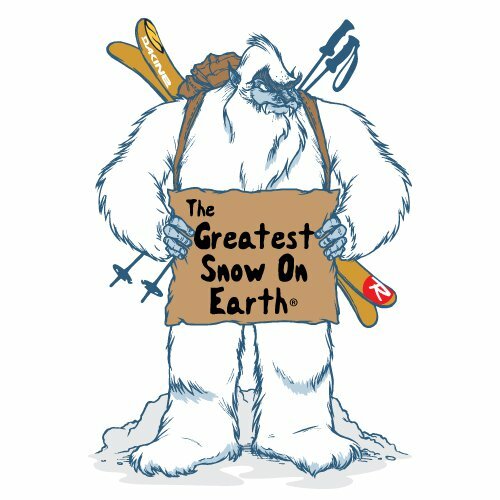 If you've skied in Utah you've probably had a run in with the Yeti. Making his home in Utah's mountains he roams the powdered landscape looking for the best snow on the planet. 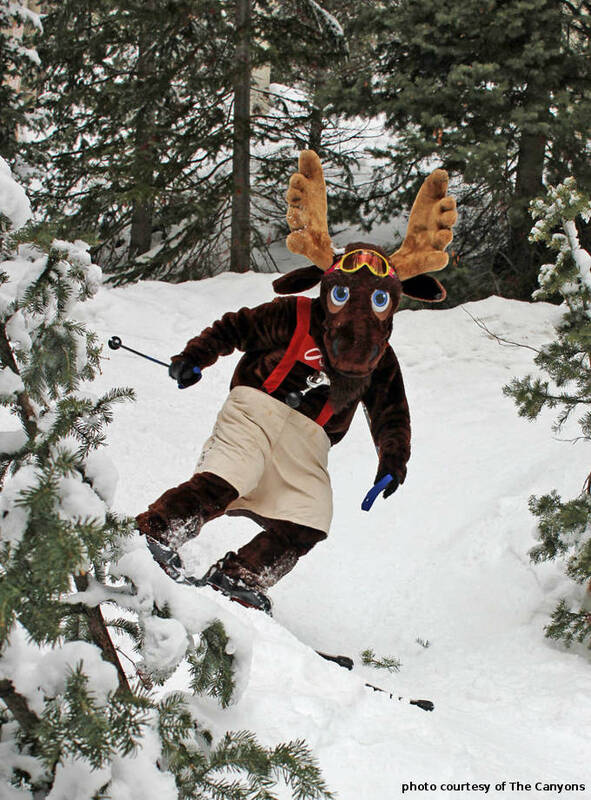 He's been hired as mascot for all of Utah's ski resorts. See our review of the ski resorts of Utah. 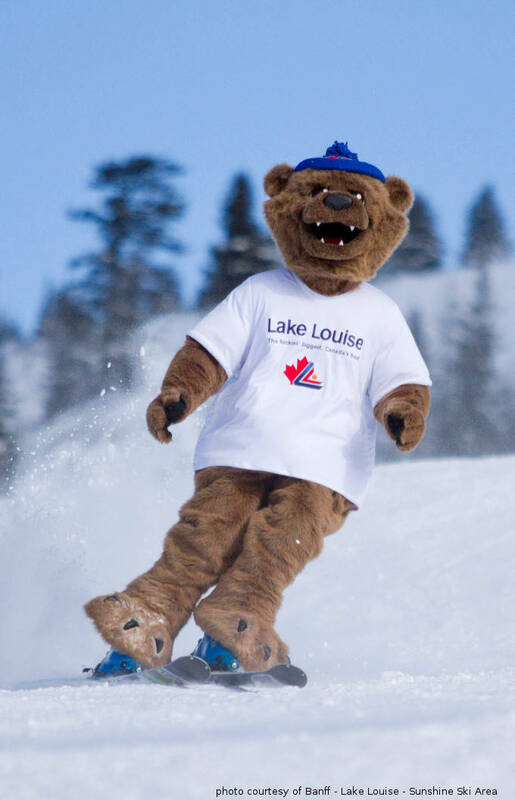 This year the Banff - Lake Louise - Sunshine Ski area in Alberta Canada proudly unveiled it's brand new Mascot, Griff the Grizzly Bear! Banff-Lake Louise celebrated by the hosting NFL Mascot Day featuring some of the most famous mascot faces in the NFL. You'll know him by his giant yellow trunk! This over-sized Arena-Funt is photo ready and dressed to impress in a top hat and his best red ski boots. FUNty helps spread the joy of skiing to little ones on the slopes and even volunteers to accompany children on their first downhill attempts. The multi-talented, Pitzi the Mountain Goat, can be found teaching children to both ski and climb at Pitzal Glacier & Ski Resort! We just haven't personally sighted the goat and are awaiting patiently to catch a glimpse. 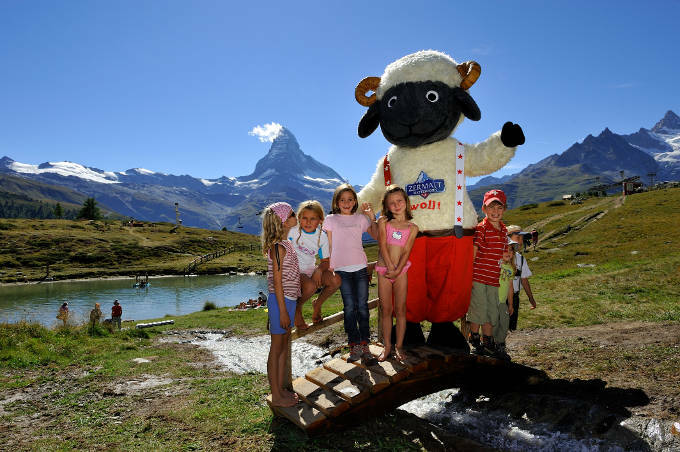 Not to be confused with Mammoth Mountain's Woolly, this black-nosed sheep is the official mascot of Zermatt Matterhorn - Switzerland. He represents the rich cultural history of the mountain shepherds. Although a St. Bernard, this canine takes his cues from the Dalmatians whose breed traditionally serves in a mascot capacity. 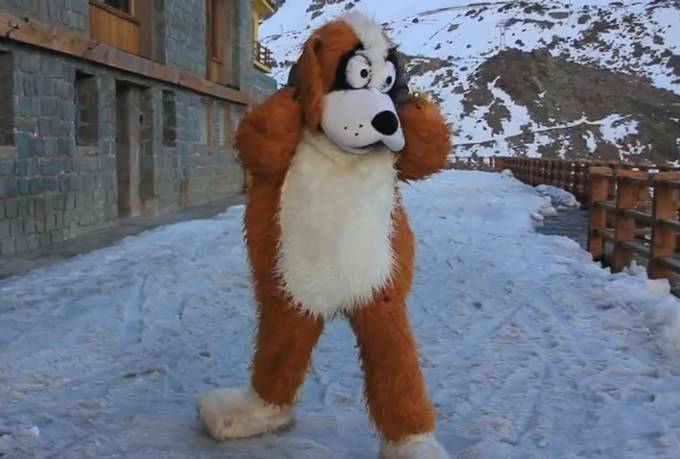 There is rumor of another St. Bernard holding down the fort at Timberline Ski Area in Mount Hood. We asked Rasca about it but he insists he's never heard of 'em. Nothing screams ski resort like a giant half boiled egg! 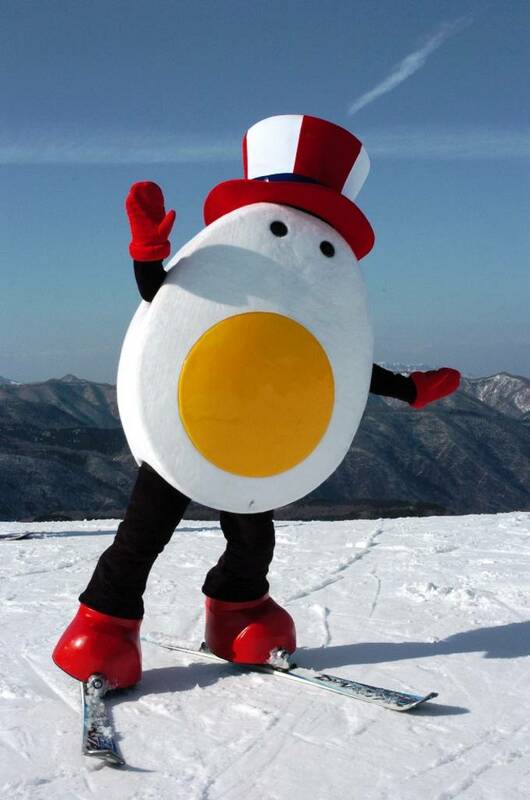 While exploring the slopes of Japan's Hunter Mountain Shiobara in Tochigi you might catch a glimpse of Hantama-kun who came to life one day when someone started playing with their food. His name literally means "half egg." Hantama-kun's signature move - sprinkling salt and shaking his yolk! Also see MountainYahoos.com World Review Of Ski Resorts and our 3D Virtual Globe Of The Ski Resorts Around The World.